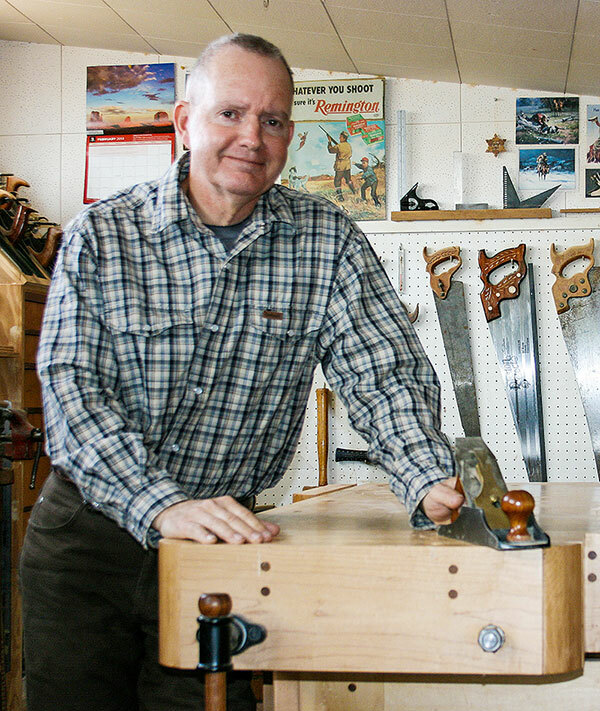 My interest and dedication to excellence in the field of woodworking can be traced all the way back to my great grandfather’s exceptional woodworking career during the 1800’s. I remember growing up in my childhood home with a handcrafted side board built around 1870 by my great grandfather. 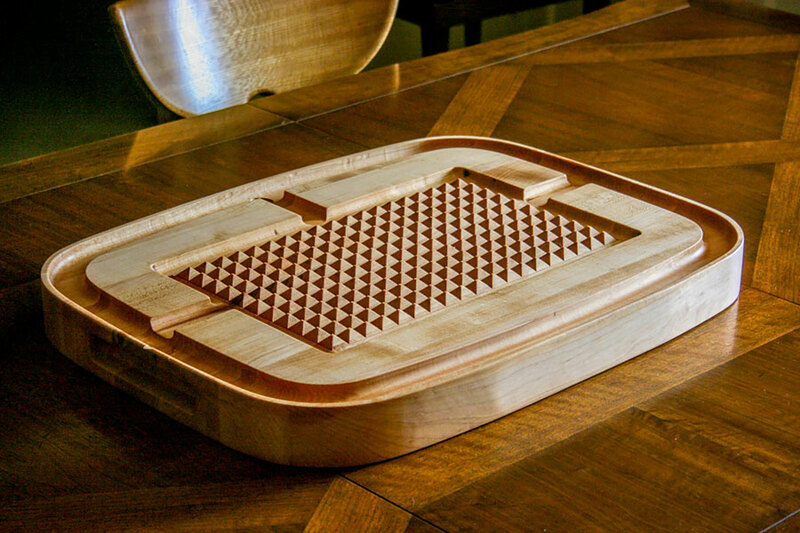 This inspired me to hone my own woodworking skills over the years to come. By 1852, my great grandfather had established his reputation as a master wood craftsman to the point that the Governor of Wisconsin commissioned him to move from Philadelphia to Madison, Wisconsin in order to construct his new personal residence. After that project, he went on to complete many beautiful homes in the Madison area still in use today. It was this legacy that inspired me to carry on the family tradition. I am often reminded of how God has blessed my life with such a wonderful and creative family history. 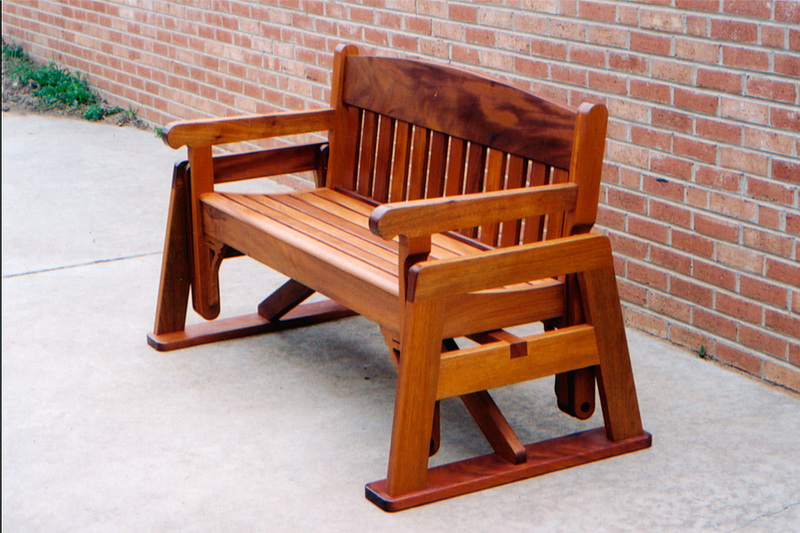 In the 8th Grade, I tackled my first formal woodworking project in a woodshop class. With the guidance of an excellent instructor, I completed a workbench that I still use in my shop to this day! 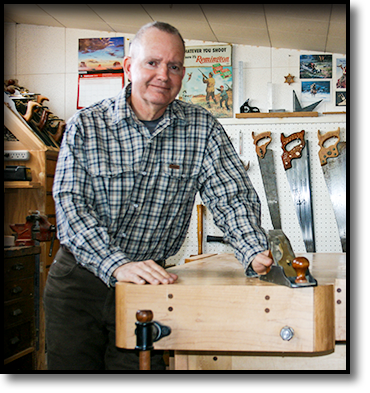 For many years I remained an “amateur” woodworker while pursuing a career in the retail and service business. 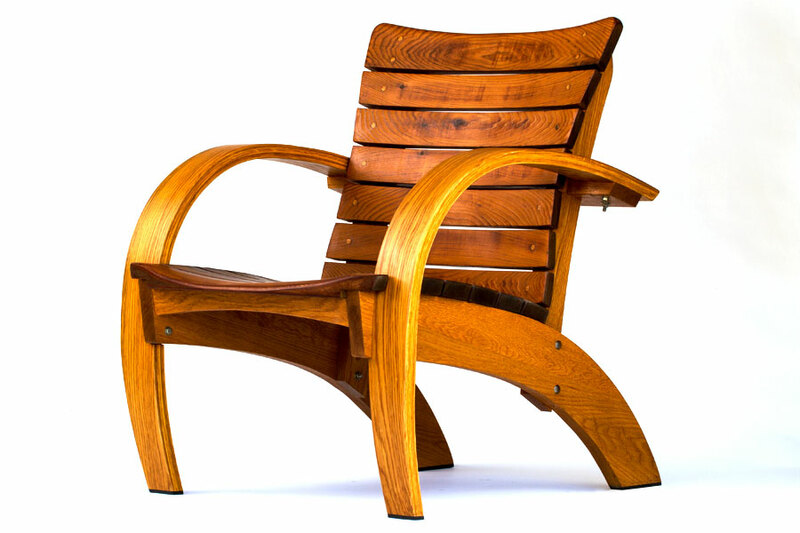 When the opportunity presented itself in 1997 to start my own “professional” woodworking business, it was a dream come true... a chance to finally design and build unique handcrafted furniture that could be enjoyed by other families and companies for generations into the future. 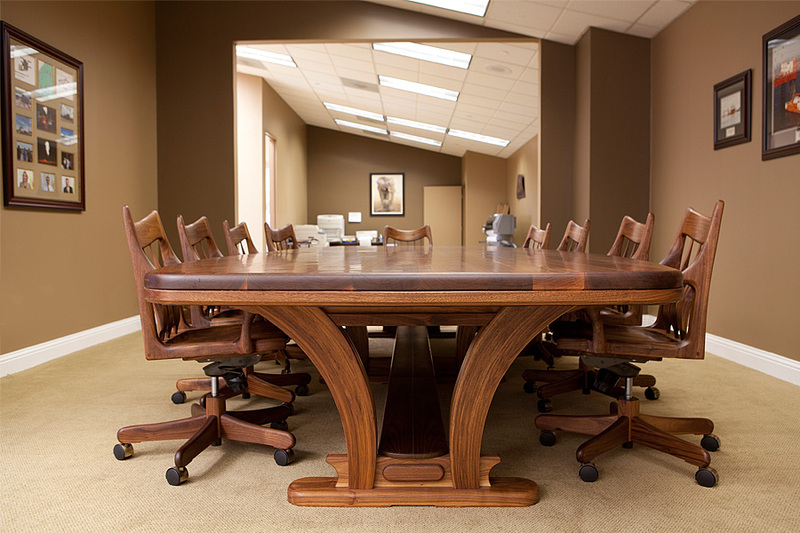 Since that beginning, my furniture designs have found their way into the homes and offices of many satisfied clients. 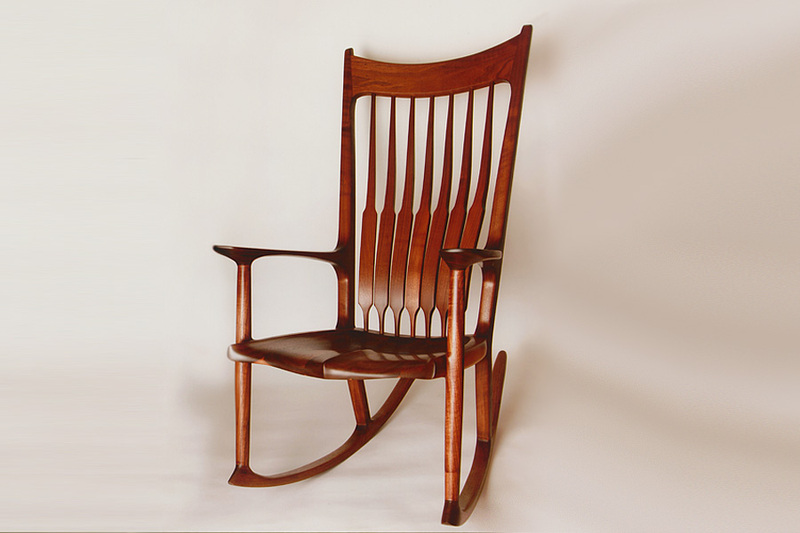 It is my hope that a part of my great grandfather’s achievements are reflected in the furniture I create today. 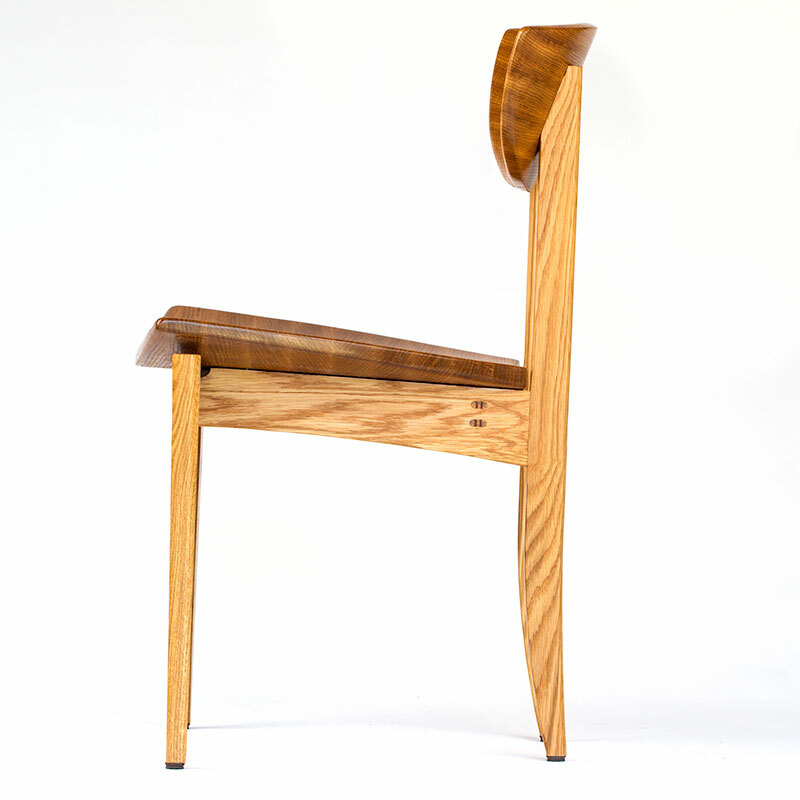 I hope that one of my handcrafted pieces of furniture can find its way into your home or office in the near future! 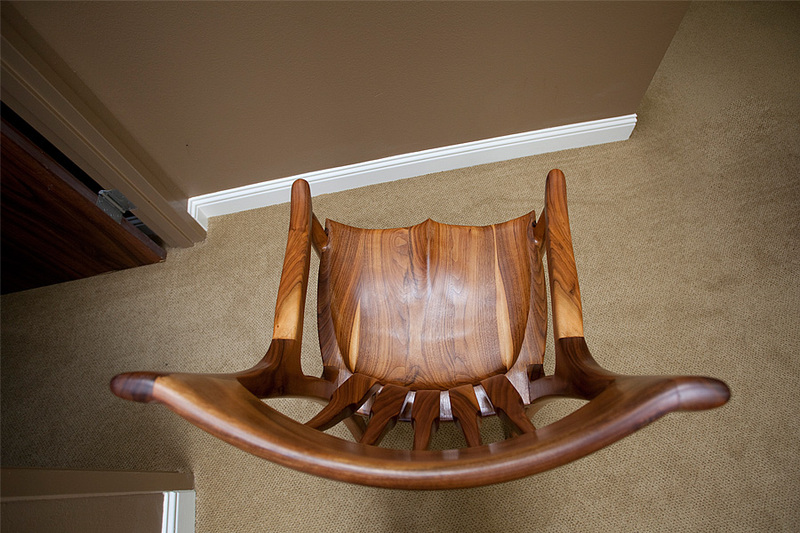 Owner - Chase Woodworking Co.
the more everything looks the same! 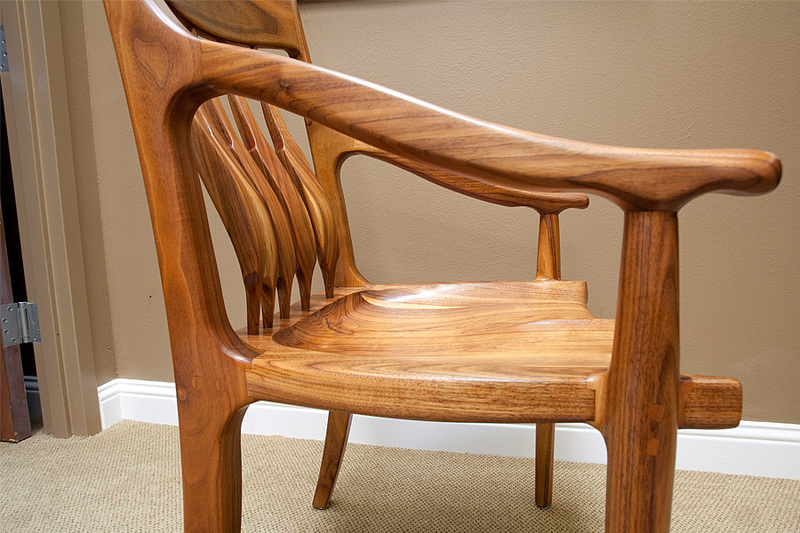 ONLY SKILLFULLY HAND-CRAFTED CUSTOM-DESIGNED FURNITURE can meet these demanding standards for most individuals. Assembly line, mass-produced, “one-size-fits-all” furniture has many short-comings. 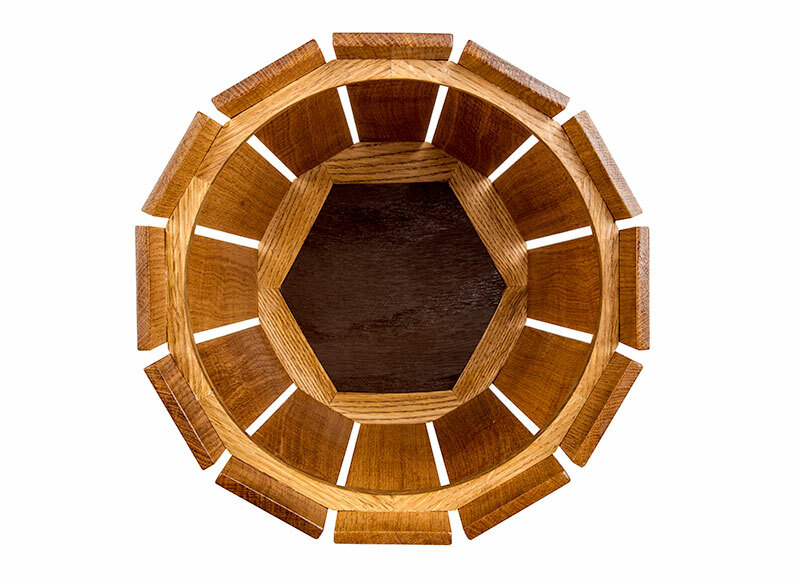 Unlike custom hand-crafted pieces produced to order by a master craftsman, their pieces are confined to the capabilities and limitations of the machines they use and the materials they can acquire at the lowest bulk price . They simply cannot address an individual’s specific needs or desires. The four objectives listed above are constantly fighting against one another. 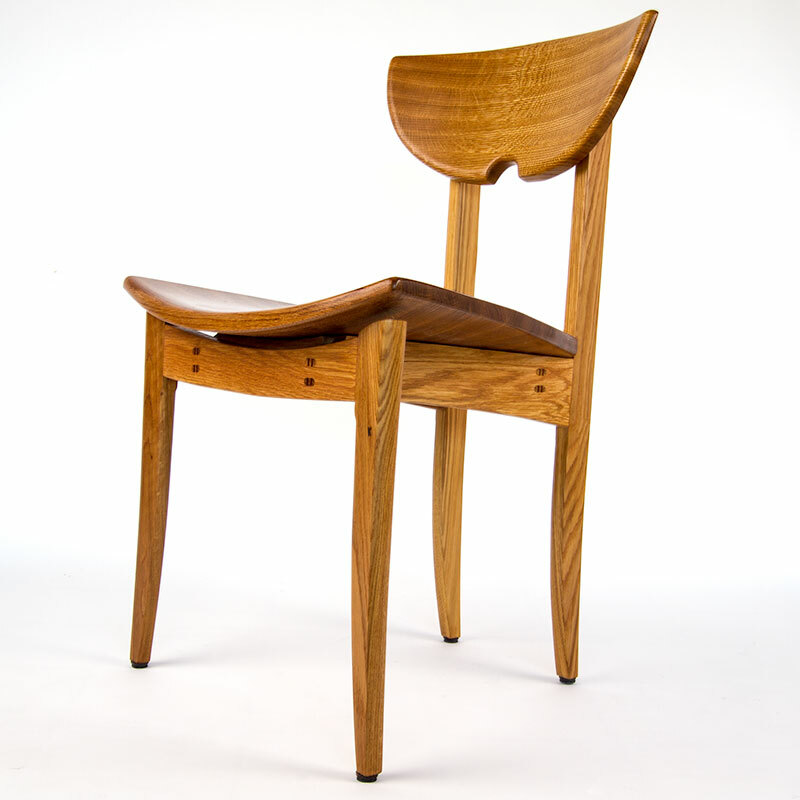 A chair back and seating surface require thicker boards, deeply saddled to make them comfortable. 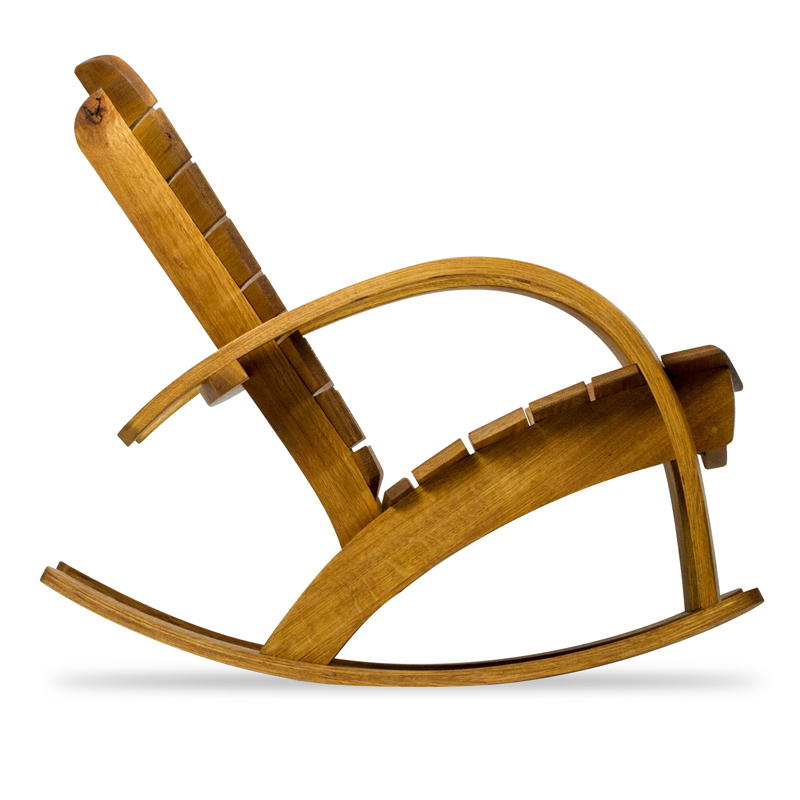 However, nobody wants to “see” this unbalanced thickness in relation to the other chair elements because it would destroy the “beauty” of the chair. 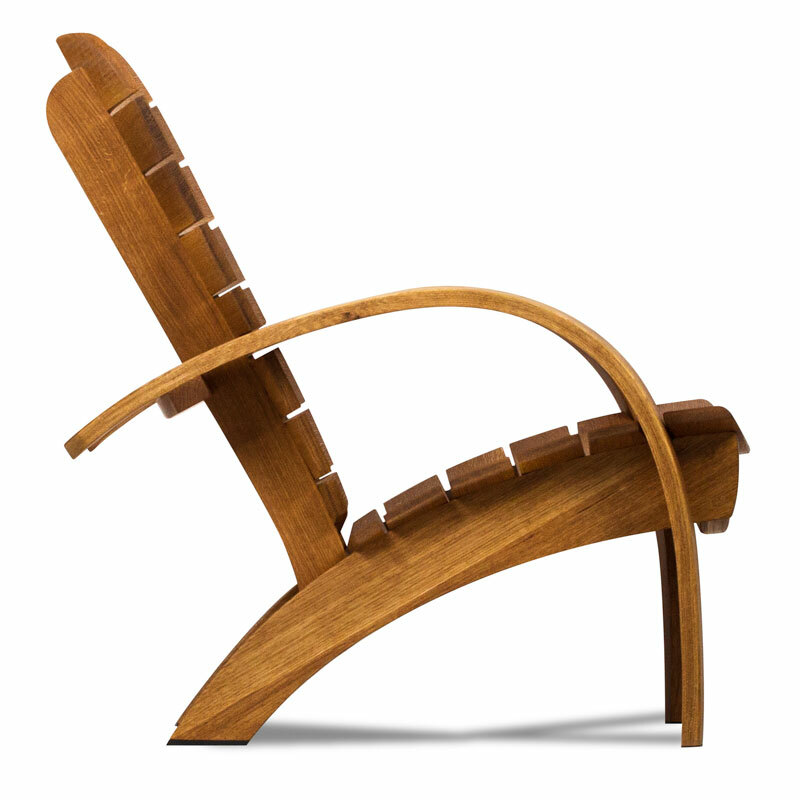 The craftsman must design and build furniture, concealing this thickness, while taking full advantage of it. 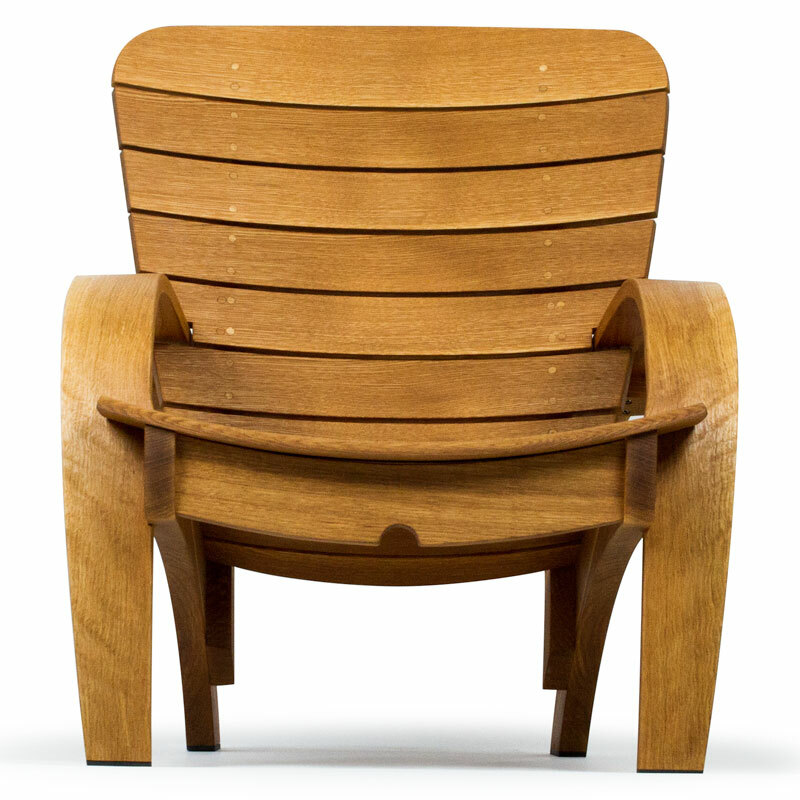 The “Big Bend Patio Chair” and the “Permian Chair” both embrace and reflect this key design concept. Furniture must also fit into its resting environment. 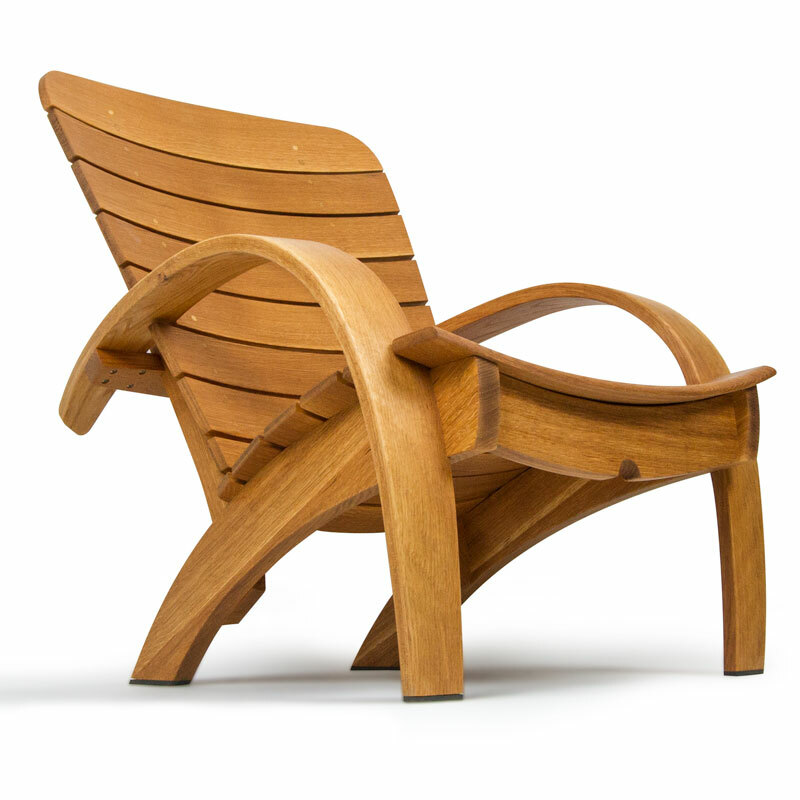 The “Big Bend Patio Chair” incorporates a signature “bend” in its integrated front leg/armrest design which allows it to assimilate with other natural outdoor elements where “bends and arches” are echoed in surrounding trees, trellises and vines. 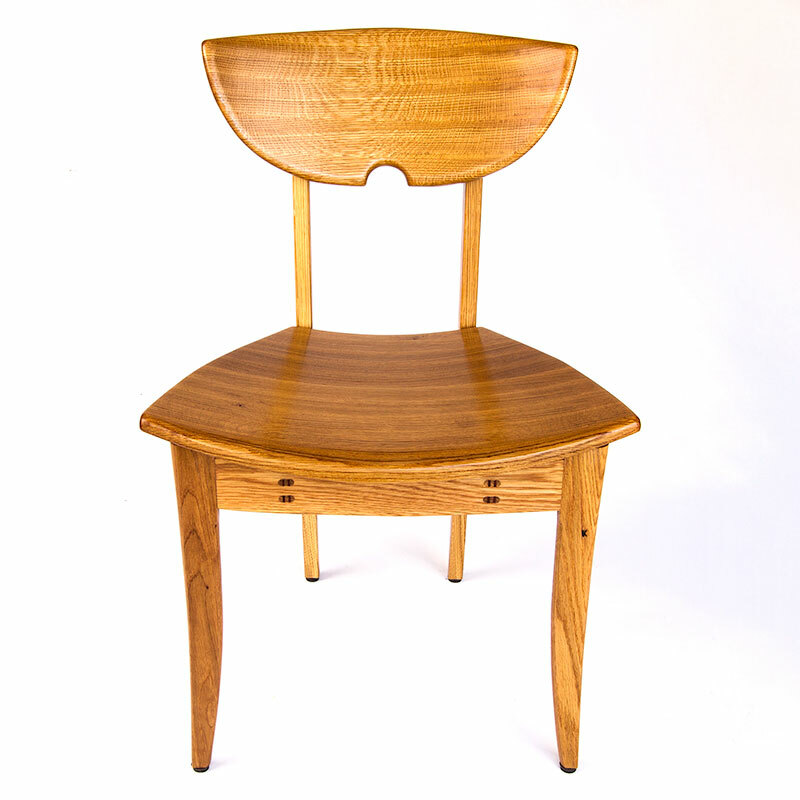 The “Permian Chair” with its curved back and seating surface is an obvious compliment to a round kitchen table; however, it is equally at home surrounding a square table with it’s straight legs and rails. 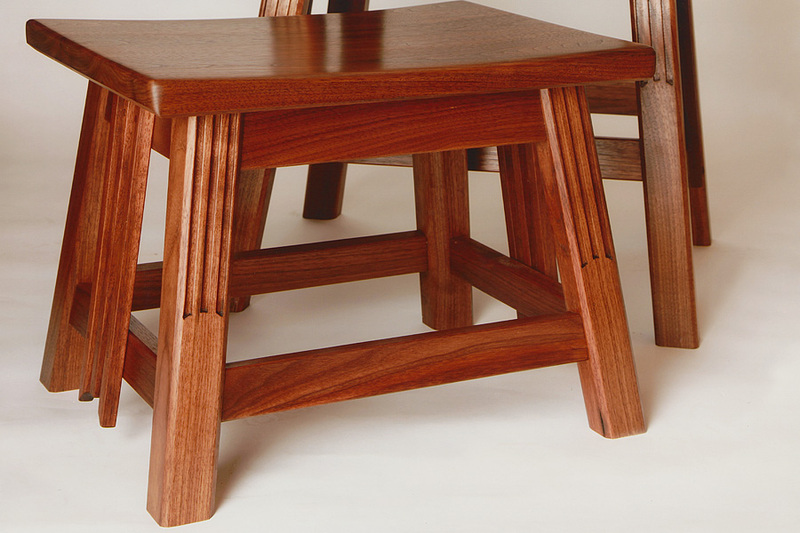 The exposed wood joints are consistent with high quality craftsman or “mission-style” furniture. 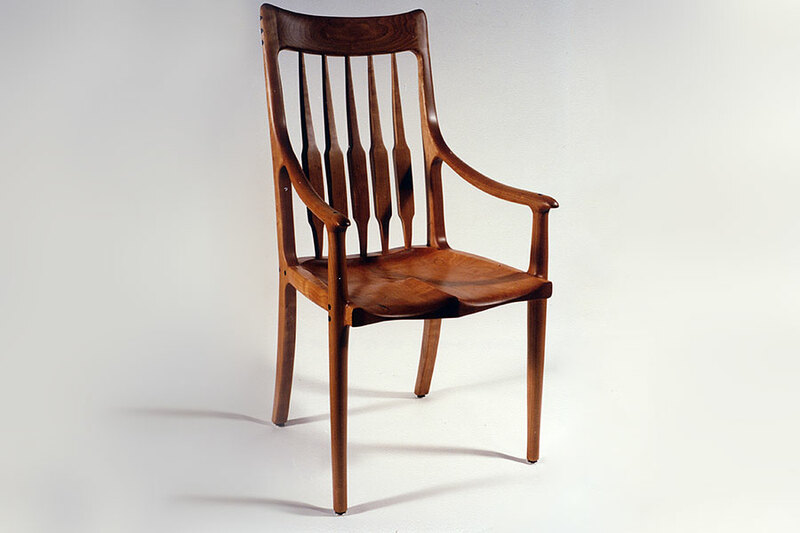 Chase Woodworking Co. is committed to achieving the four objectives of excellent furniture design in EVERY PIECE I design and build. 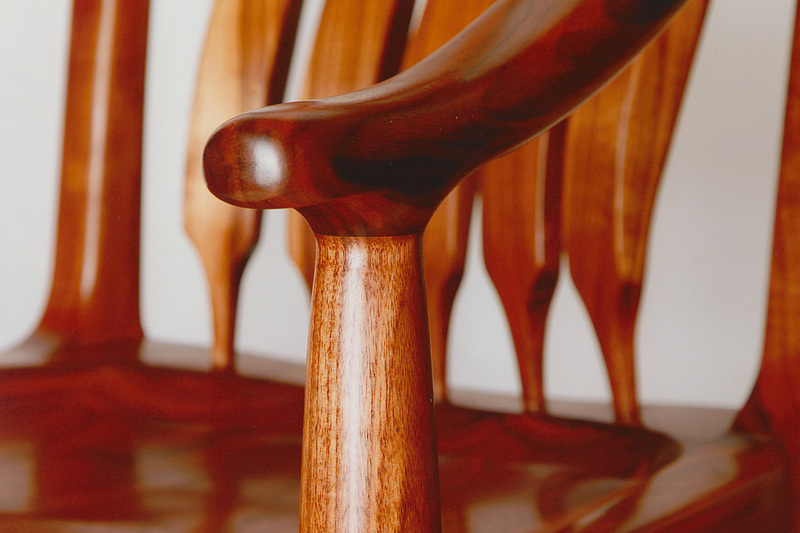 When considering handcrafted furniture just “Cut to the CHASE”! FRONT LEGS and ARMRESTS consist of (8) 1/8” thick oak strips laminated together. 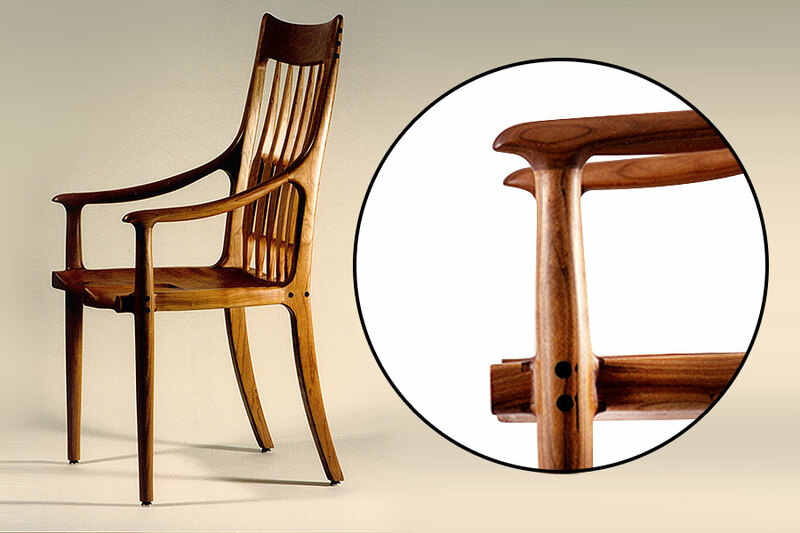 When bent, they yield an incredibly strong and attractive frame foundation. SEATS SLATS and BACK SLATS have gentle curves to afford “hours” of relaxation. They are screwed (not glued) to the frame with stainless steel screws and are concealed. ALL LEGS have 1/4” thick high impact plastic feet to keep wood out of water. 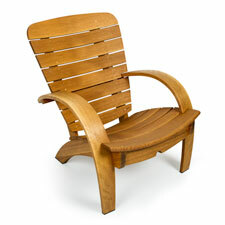 These are the most beautiful, durable, and comfortable patio chairs available. 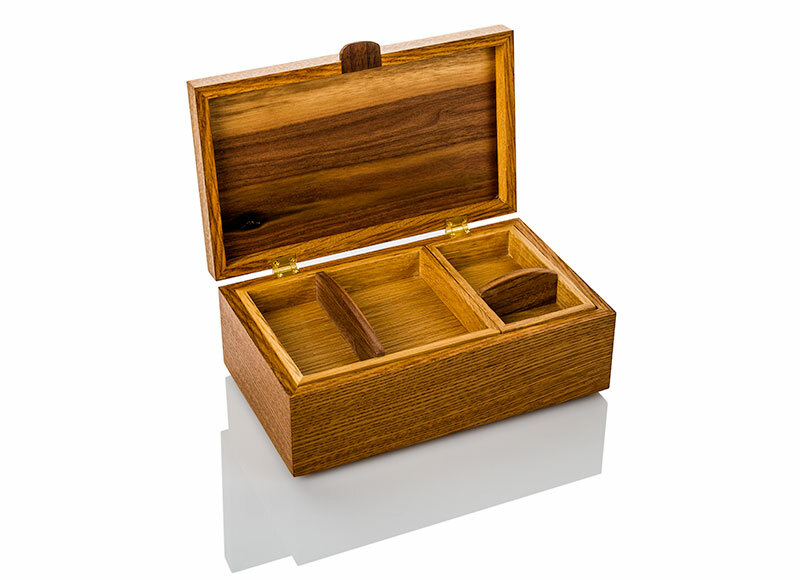 Made of white oak, in a natural weather-proof oil finish. Other woods are available. While these are "production" models, they are still "custom-built". Normal turnaround is 4-6 weeks depending upon current workload and number units in inventory. 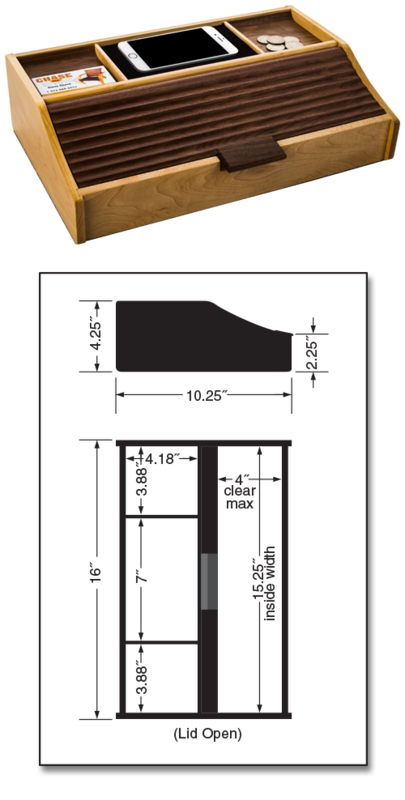 Please call to receive a more accurate production-time estimate on your particular order. These are the most beautiful, durable, and comfortable rocking chairs available. 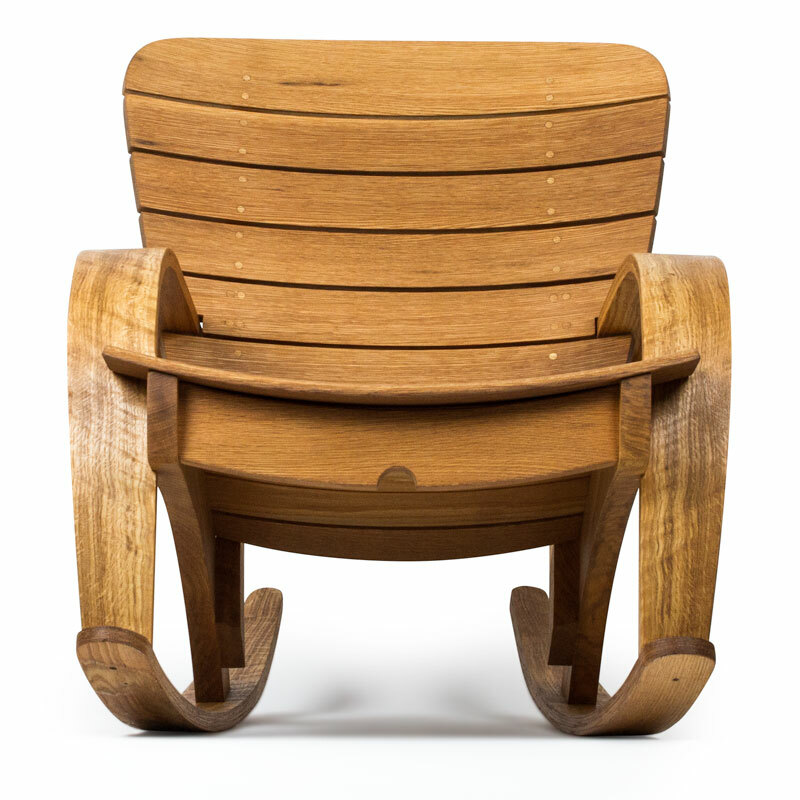 SEAT and BACK are “sequence cut” across growing rings to expose a beautiful wood-grain pattern. 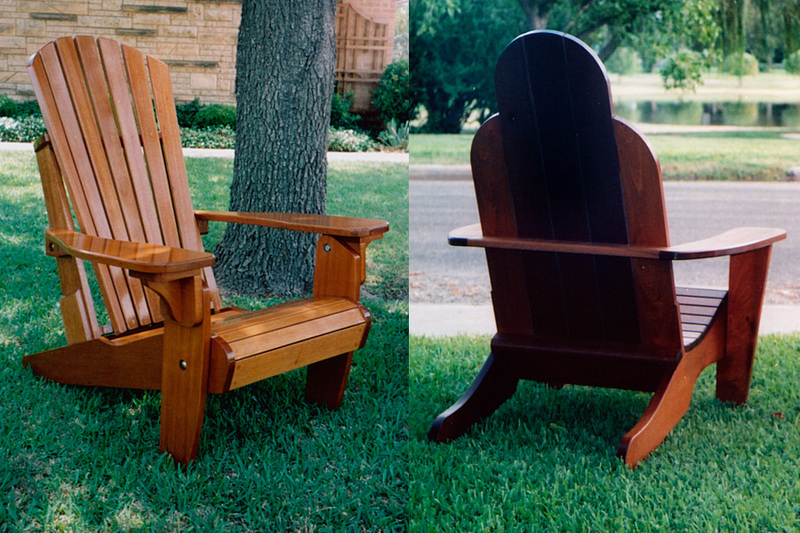 Both pieces have gentle curves to make seating very comfortable for all sized individuals. ALL LEGS have glides on bottom to protect floors and assist in sliding. 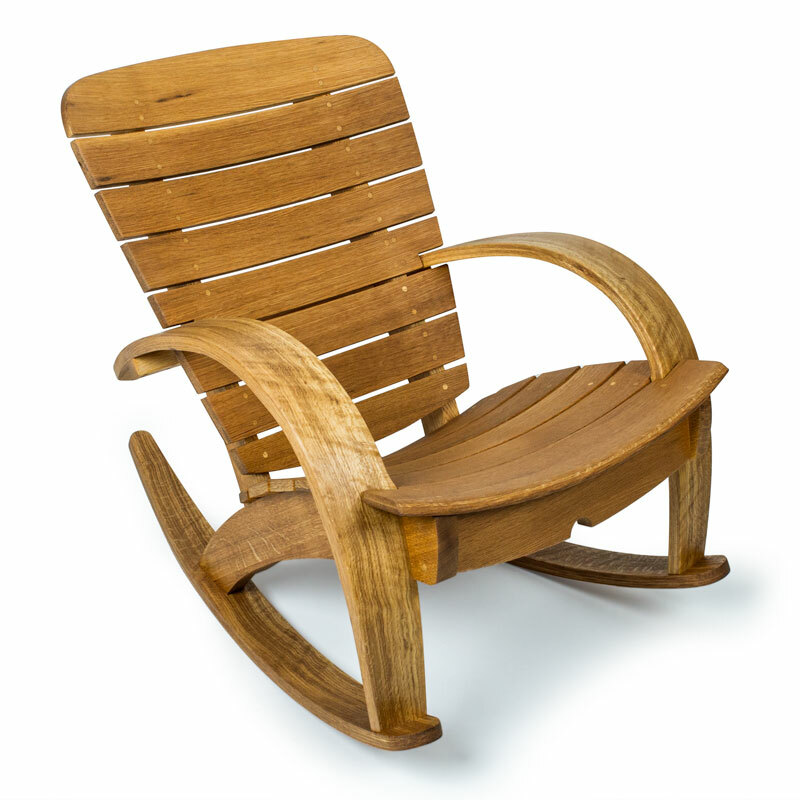 This hand-crafted chair is designed and engineered to be enjoyed by you, your children and your grand-children for many years to come. 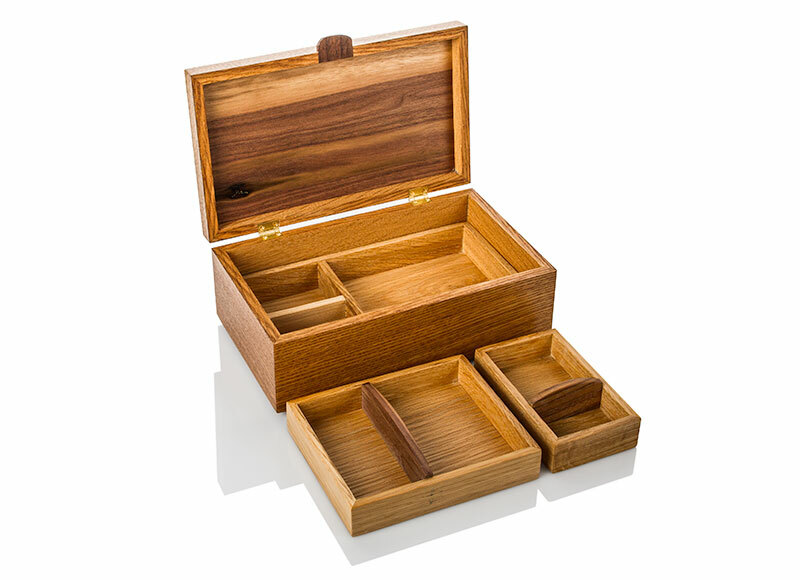 Made of white oak with strong mortise and tenon wood joints. 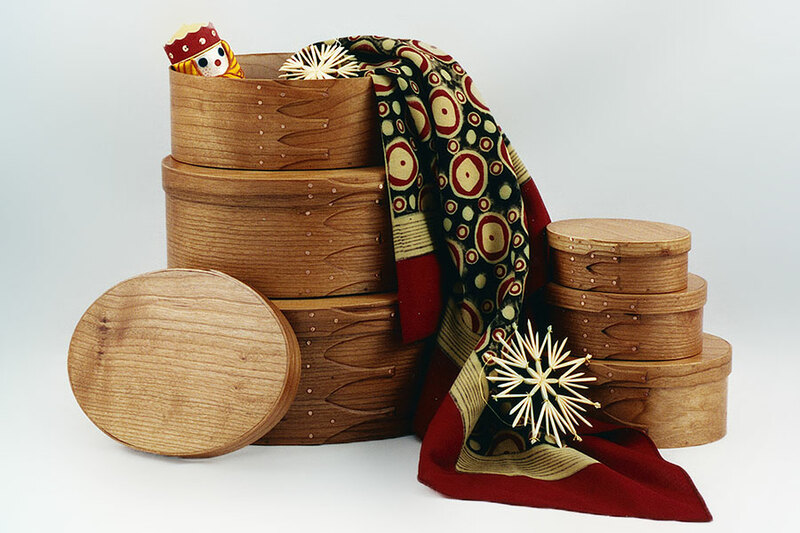 Seven thin coats of hand-rubbed oil and wax are applied to protect and enhance the beauty of the wood. Top-middle "Cellular Phone" Tray is lined in felt. Bottom of unit is also covered in a heavy felt material to avoid scratching your other furniture. Imagine having all your items kept in one place, when you are not carrying them. 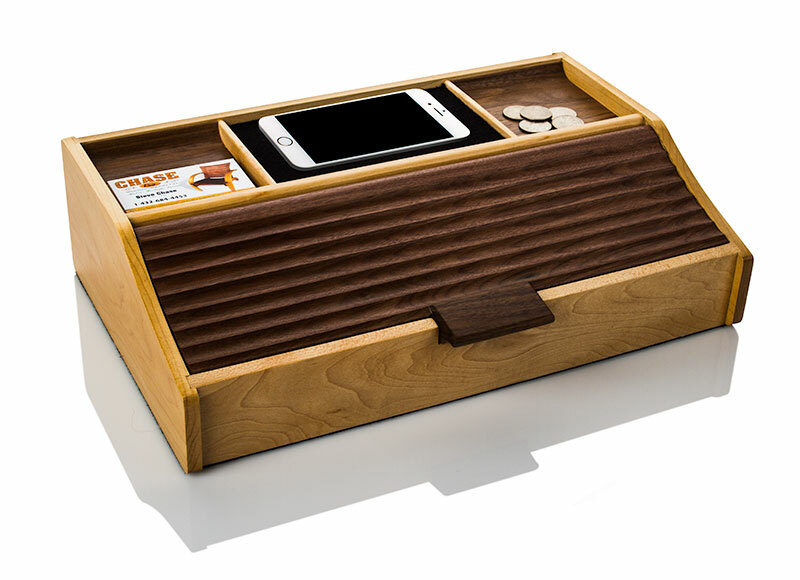 Lots of room for your Cell Phone, keys, pocket change, pen, eye glasses, watch, pocket knife, etc. Made from hard maple and black walnut. Incorporates two, finest quality Brusso® solid brass hinges that open to 95-Degrees, so that the lid stays open. 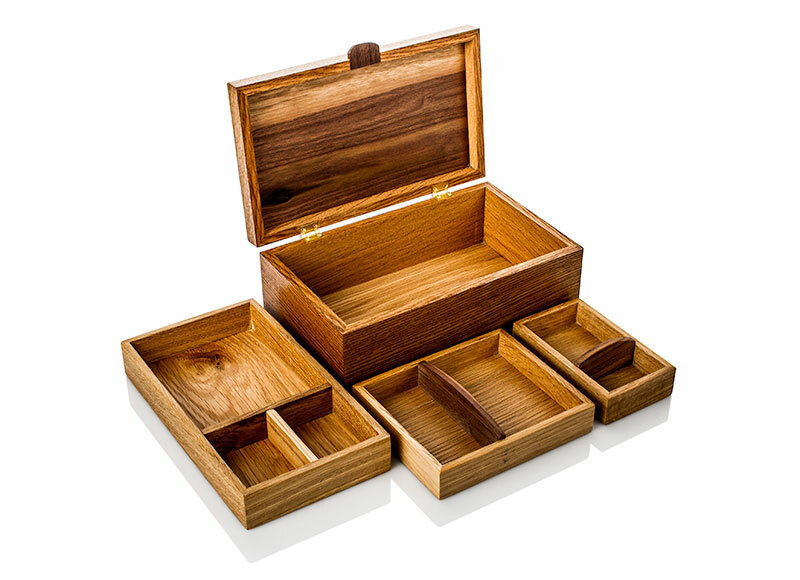 Unit includes (3) precise-fitting removeable/stackable trays. 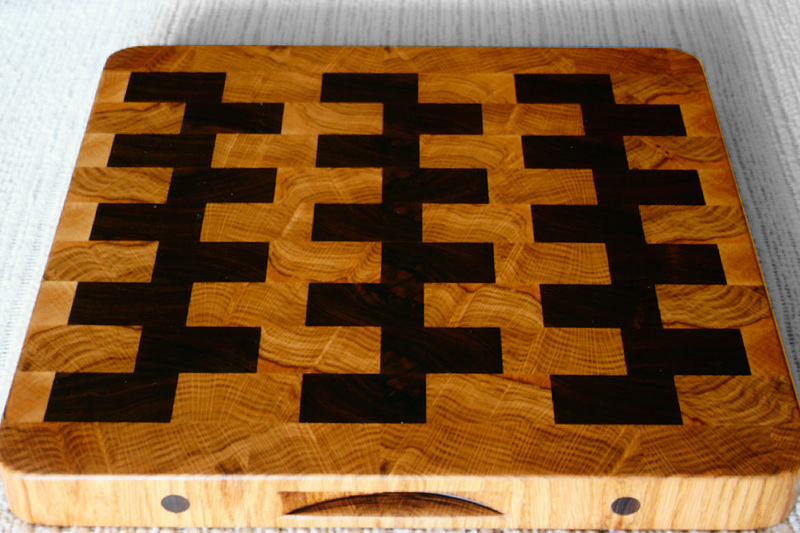 Made from quarter sawn white oak and black walnut. 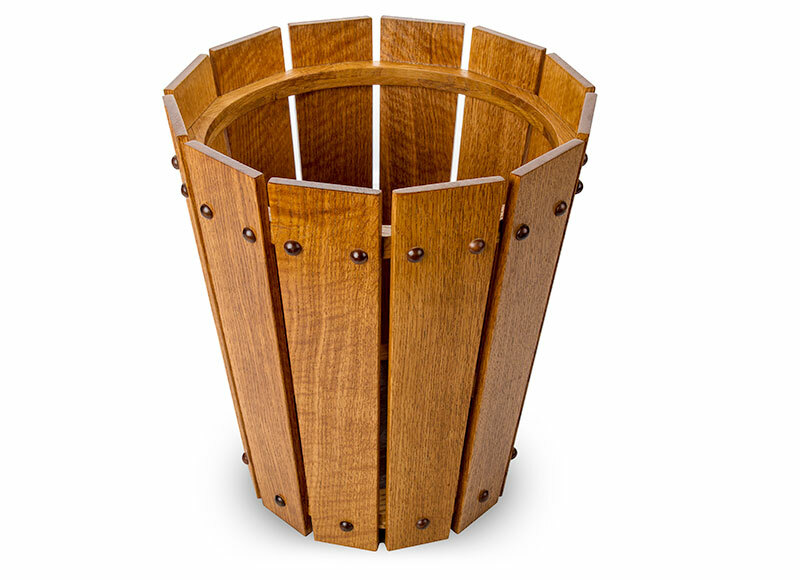 Beautiful replacement for unsightly/old trash containers. 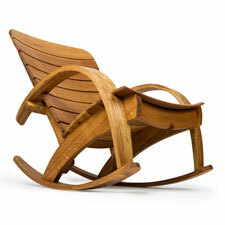 Compliments any beautiful office or home furnishings. 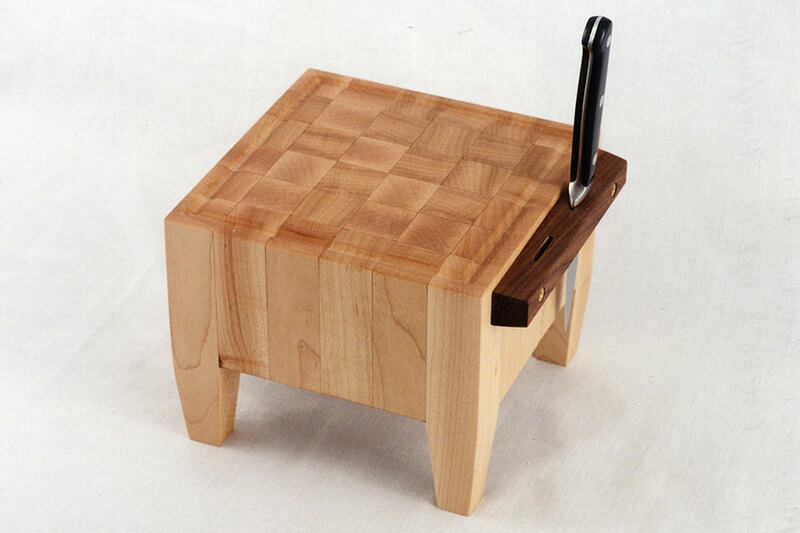 Made from quarter sawn white oak with walnut buttons. This is a multi-generational gift for your children and grand children! No two horses are the same. Very smooth riding for young Cowboys and Cowgirls. 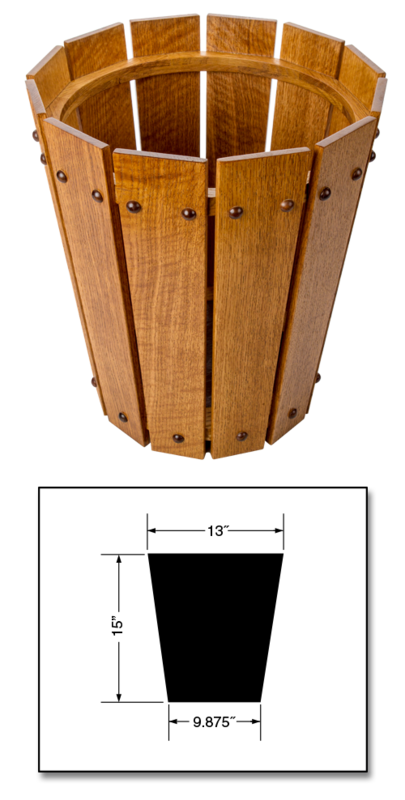 Base is made from white oak for beauty and durability. 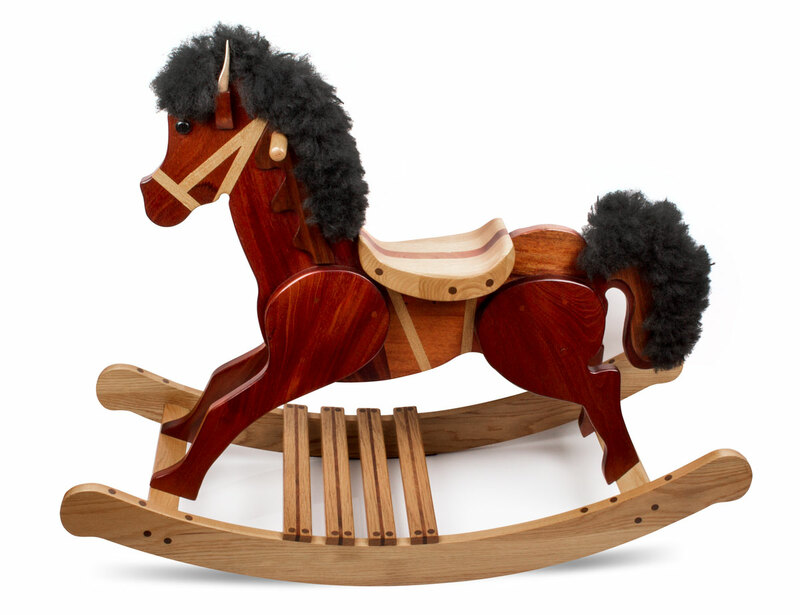 Mane and tail are fade resistant and non-allergenic Polypropylene. 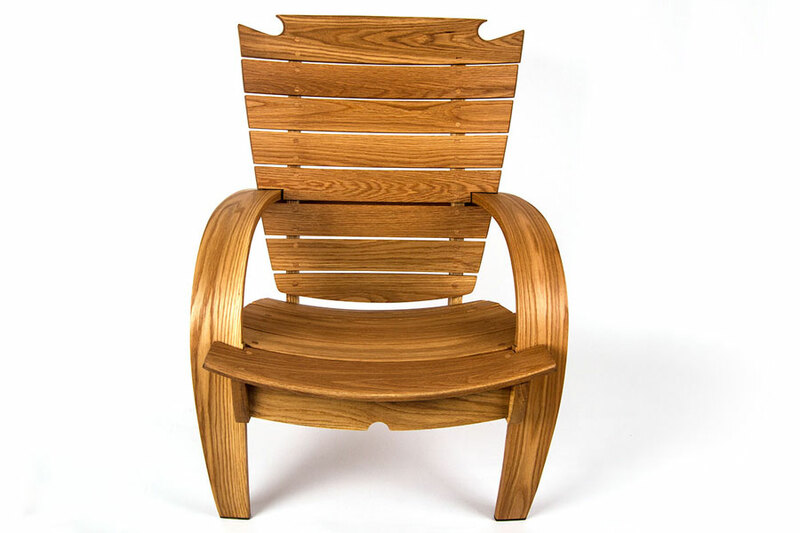 “I discovered Chase Woodworking in June, 2008, and asked Steve to come over to my office to discuss building two visitor chairs. 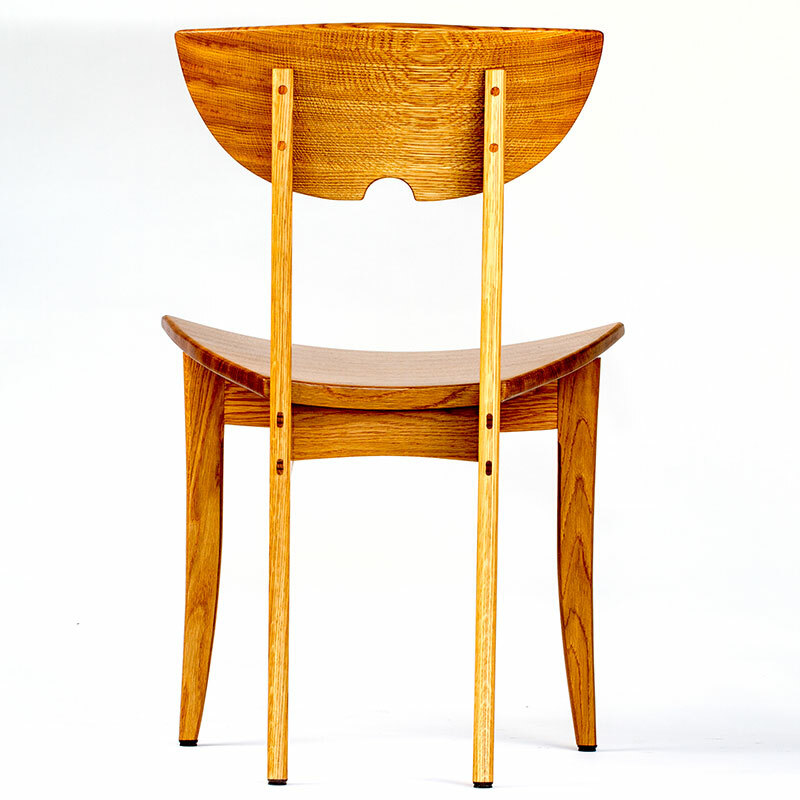 Steve took my specs and built a prototype chair out of white ash. 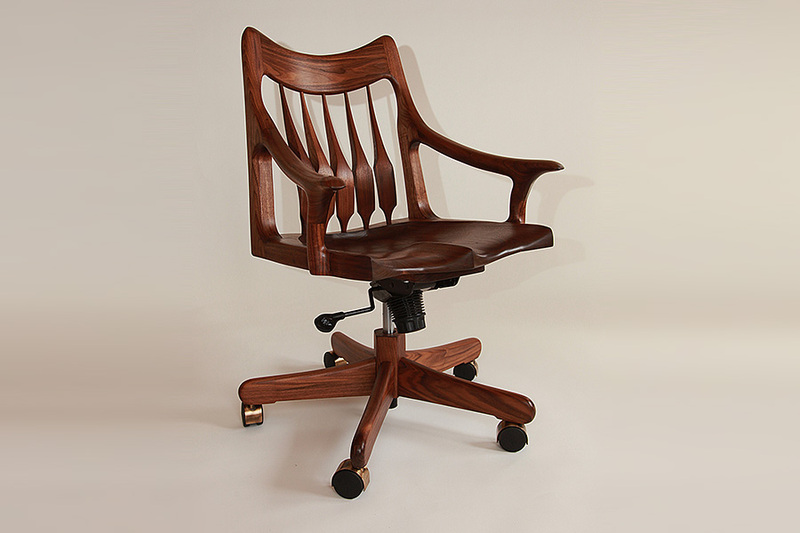 He brought the prototype to my office and gave me an opportunity to modify the height of the arms, the width of the seat, and the shape of the lumbar support. 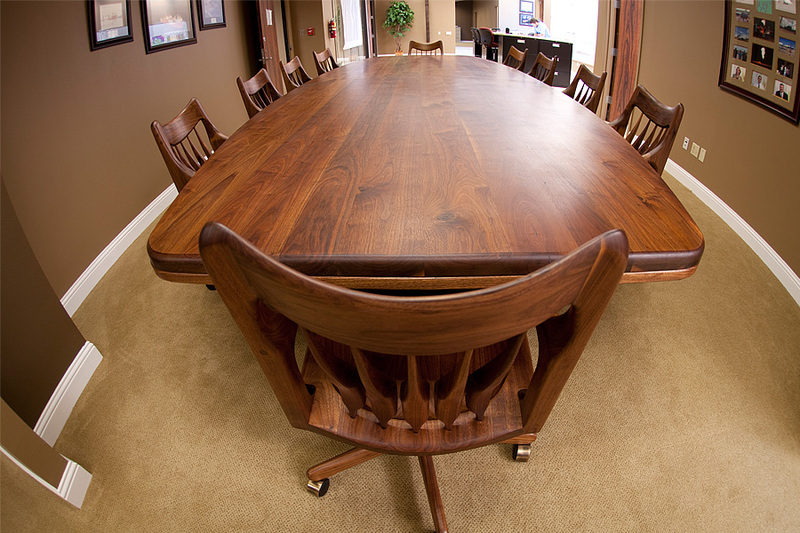 Within a few weeks, Steve delivered to my office two of the most beautiful black walnut chairs you will ever see. 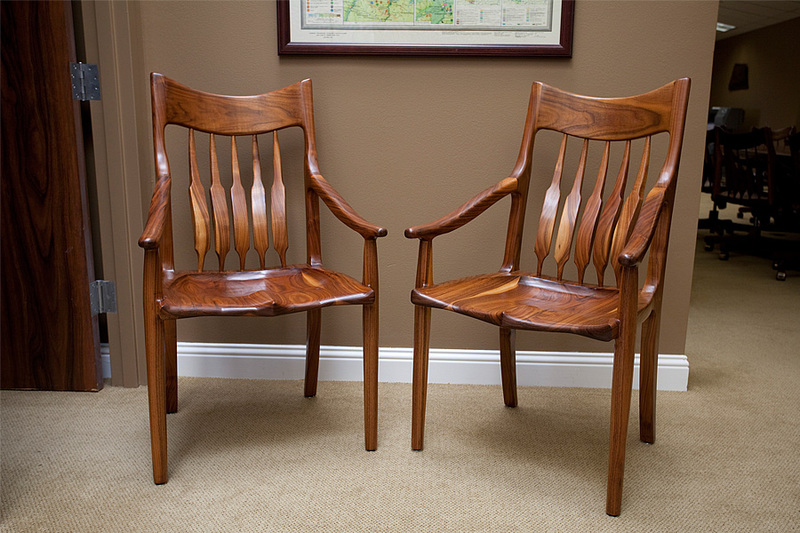 When you sit in these chairs, your back is immediately relaxed and you can't believe the comfort from sitting in a solid wood chair. Steve did such a great job on these chairs that I asked him to design and build a desk with two drawers. Steve brought me a design and worked with me to insure that he understood exactly what I wanted in my desk. 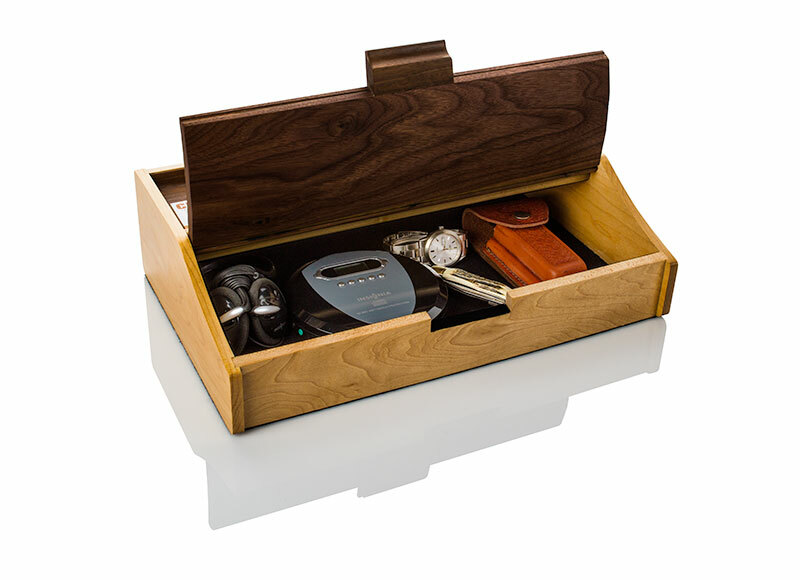 The finished product is a work of art from the dovetailed drawers to the leather signing pad. The black walnut, Steve's favorite medium, has developed a very warm coloration over these last four years. It is a joy to sit and work at this desk. 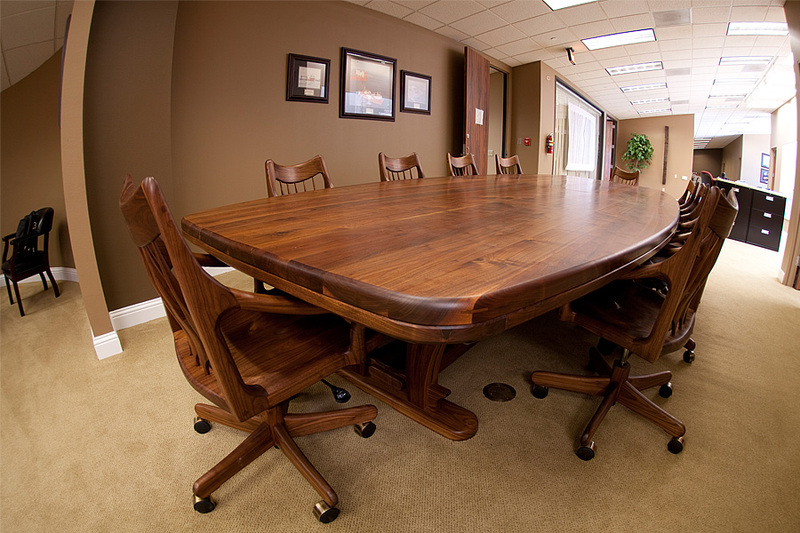 When we decided we needed a large conference table with matching caster chairs, I decided to see if Steve could take on this large of a project. I explained to Steve that we wanted to have a table design that insured that the chairs would not be able to bump in to any of the table's leg structure. The design also had to allow for moving the table into our building's elevators. Steve designed a curved table support structure that is absolutely incredible; the caster chairs move freely alongside of the table without ever encountering any of the table's support structure. When you walk up to this table, you cannot help but marvel at the artistic beauty of the leg structure and the table's massive presence. People immediately ask me how we were able to get such a massive table up to our 10th floor office. 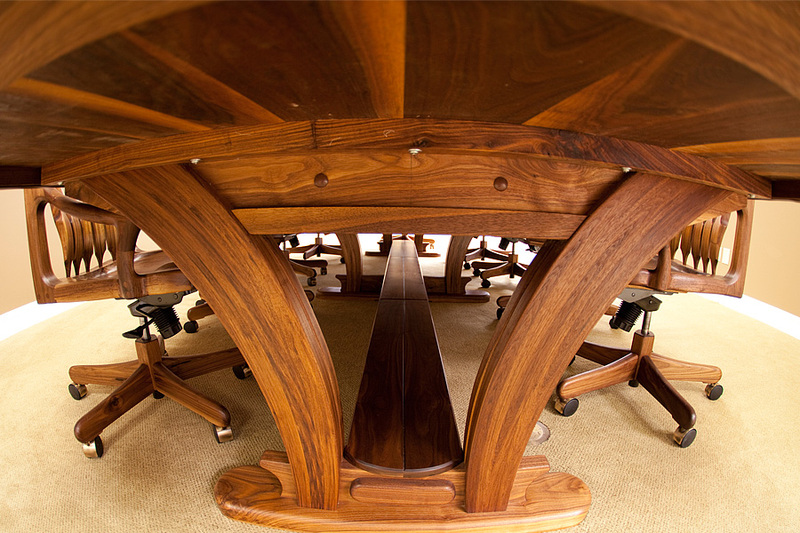 Steve designed the two piece table to fit perfectly into the elevators. 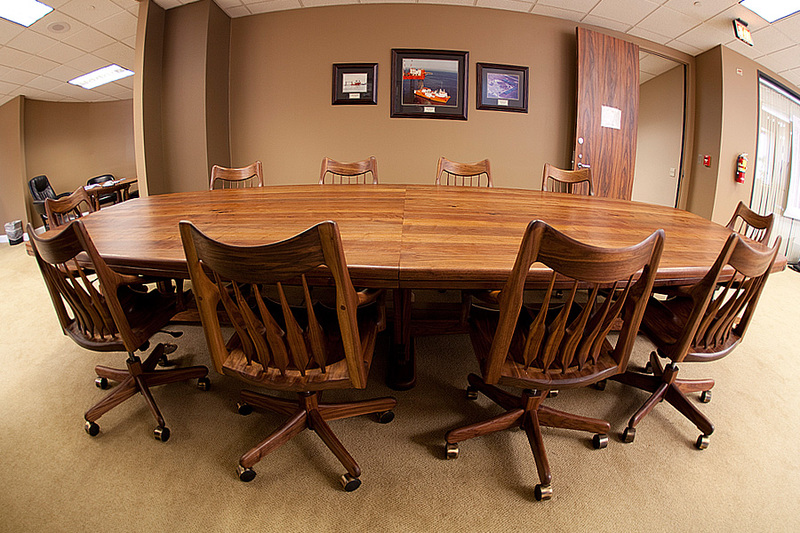 The caster chairs themselves are designed similar to my visitor chairs with the comfortable seat and lumbar support. 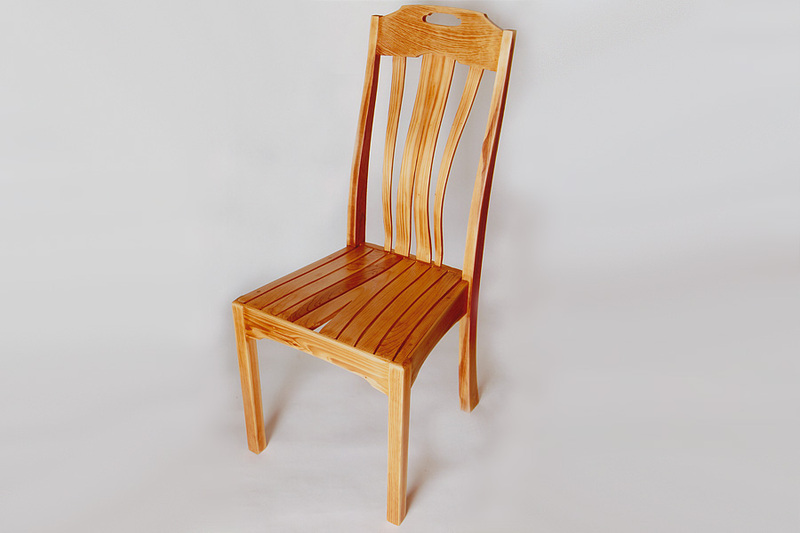 Over the last four years, our visitors have been highly impressed with the quality and workmanship of our conference table and I currently have Steve working on a very special chair that will be used for reading. If you live in or are just visiting the Permian Basin area of West Texas, be sure to call me so we can visit about your specific needs. I work out of my home in Midland, Texas and you are always welcome… just please call ahead to set up an appointment. What is the difference between "production" furniture and the furniture featured in my "gallery"? 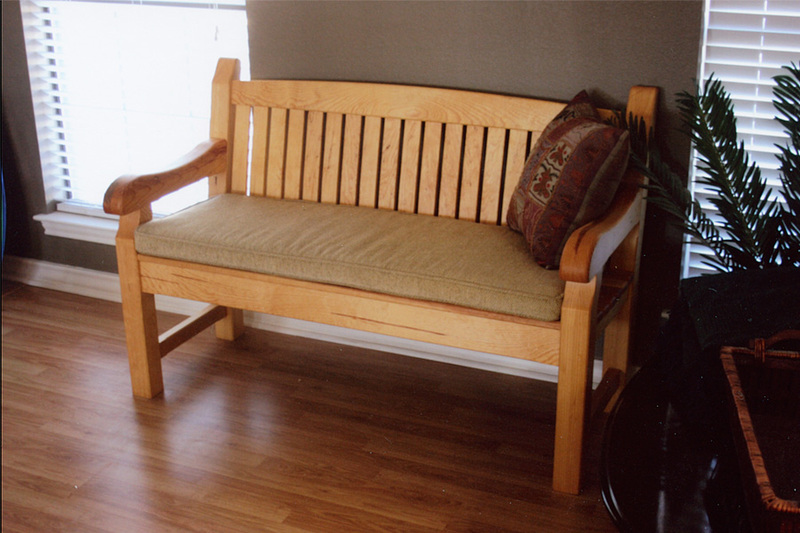 I call any piece of furniture that is built with templates and jigs, "production" furniture. Over time, these devices were developed to save time and reduce costs. 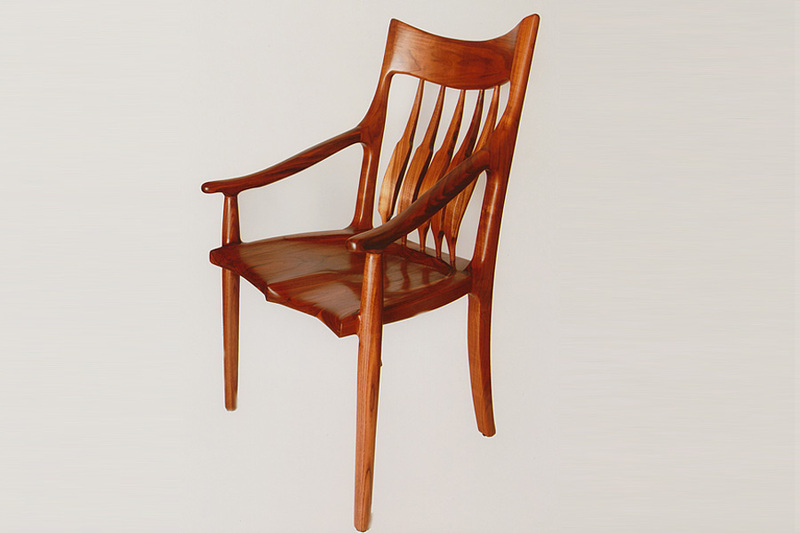 The furniture pieces featured in my "Gallery" represent unique one-off custom-made designs targets specifiaclly to a client's needs and desires. Non-Production pieces require additional time for planning and in some cases "prototyping" to arrive at the final design and strategy. Non-Production pieces start from scratch and therefore take a considerable amount of additional time and expense to complete. Absolutely not. 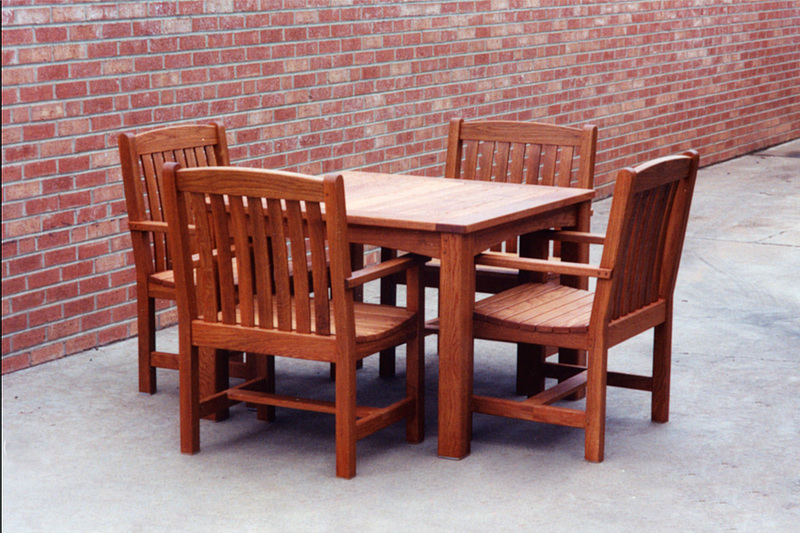 Fine handcrafterd furniture always comes pre-assembled as opposed to "break-down" mass-produced units that require customer assembly. Who actually builds the furniture? Do you have other people working in your shop? There is only "one-person" working in this small business, and that person is me, Steve Chase. All of the work is done my me. Is there any maintenance required to preserve the natural beauty of the wood? 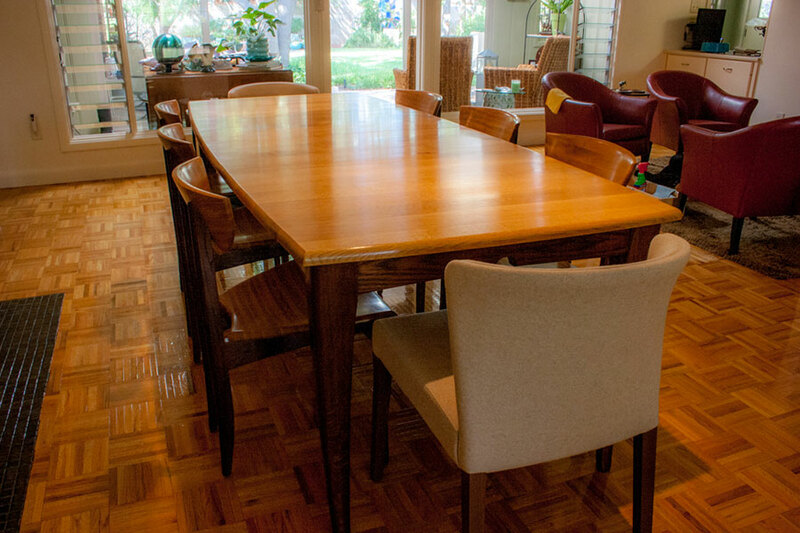 Interior furniture - only requires regular dusting and the application of a thin coat of wax every two years. 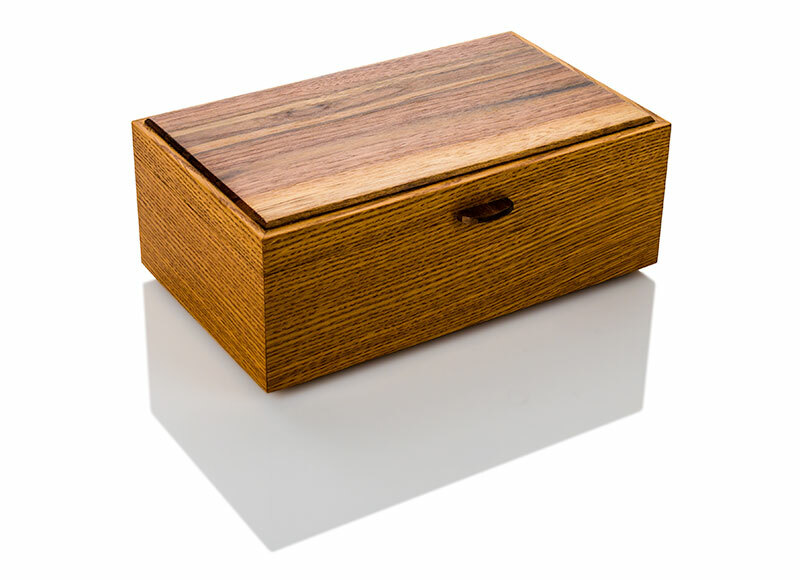 Naturally finished wood will develop a beautiful "petina" over time caused by ultraviolet light. 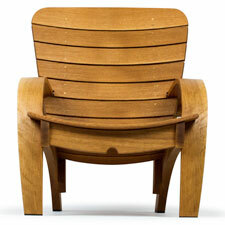 Outdoor furniture - requires more attention depending on how much exposure it has to the elements. 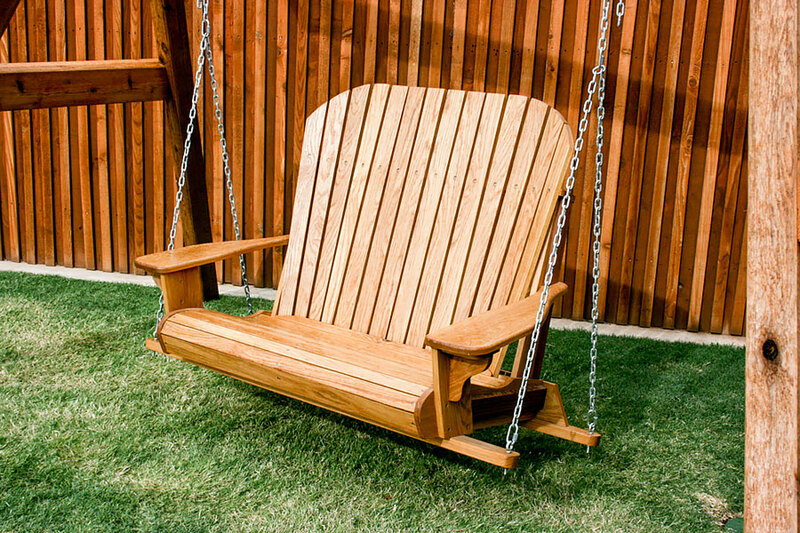 Many people like to let their outdoor wood furniture become "weathered". 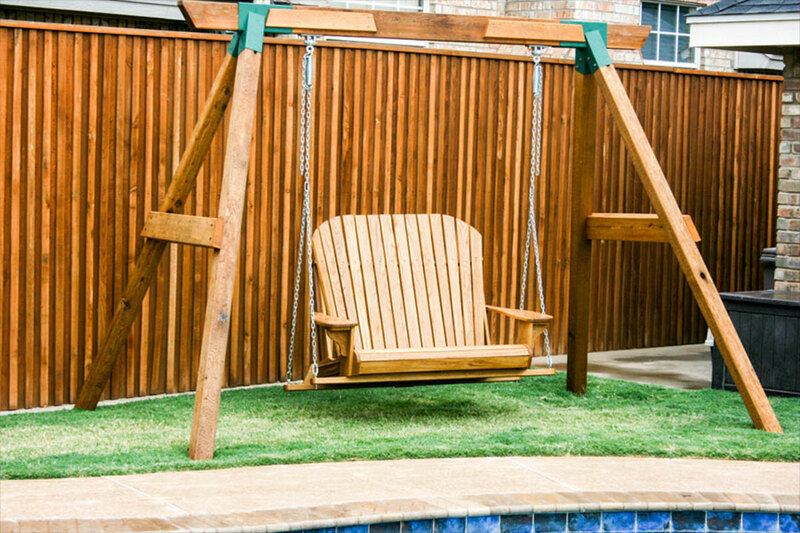 If you would rather keep the "like-new" look for outdoor furniture, contact me and I can advise you depending upon where the furniture is located. In the Midland-Odessa, Texas area, I can perform this maintenance for you if you wish. Do you "deliver" your furniture in the Midland-Odessa, Texas area? Yes. There is no additional charge for delivery in the Midland-Odessa area. How do I receive my order if I live outside the Midland-Odessa, Texas area? 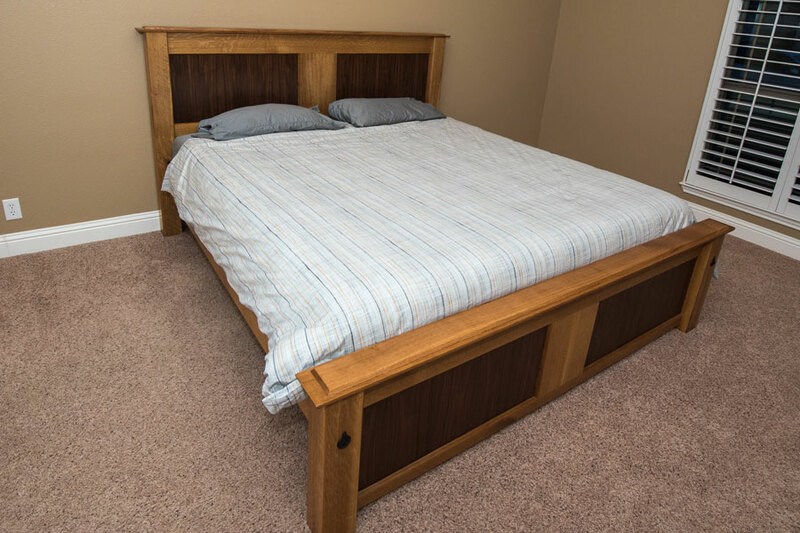 Depending upon where you live and what would be required to assure your furniture arrives in excellent condition, we would have to determine the best method of delivery for your order. In many cases, I can deliver outside the Midland-Odessa region for an additional fee. If you live far outside the immediate region, your furniture will be shipped in custom-built wood crates and/or pallets.The costs obviously vary depending on the size, weight and distance to your destination. I can always accomodate your shipping needs. After we have discussed your requirements, should you decide to proceed, I require a 25% deposit to schedule your project in my work-queue. Another 25% is due when work actually begins. The remaining balance is due upon delivery. 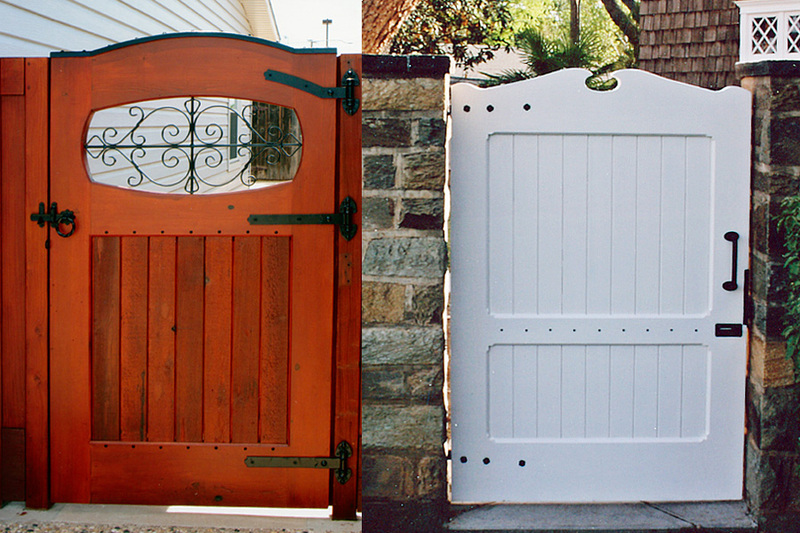 Custom projects can take from two weeks up to several months depending upon scope and workload. "Production" items are of course the quickest turn-around. I can give you a better idea of time involved when you are ready to place an order and can keep you apprised of progress at regular intervals throughout the process.